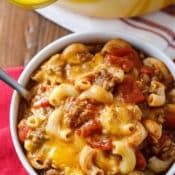 My grandma’s old fashioned goulash recipe (we also interchangeably called it Johnny Marzetti, but it’s also known as American goulash or American Chop Suey) was one of the signature dishes of my childhood. There’s just something so warm and comforting about a big bowl of grandma’s old fashioned goulash with some melty cheddar cheese on top. Honestly, I could eat the stuff every day and never get tired of it! Unfortunately, I don’t have my grandma’s old fashioned goulash recipe and she sadly passed away a couple years ago. Boy, do I miss my grandma! I had to do a little experimenting in the kitchen to get the recipe tasting the way I remember it as a child. 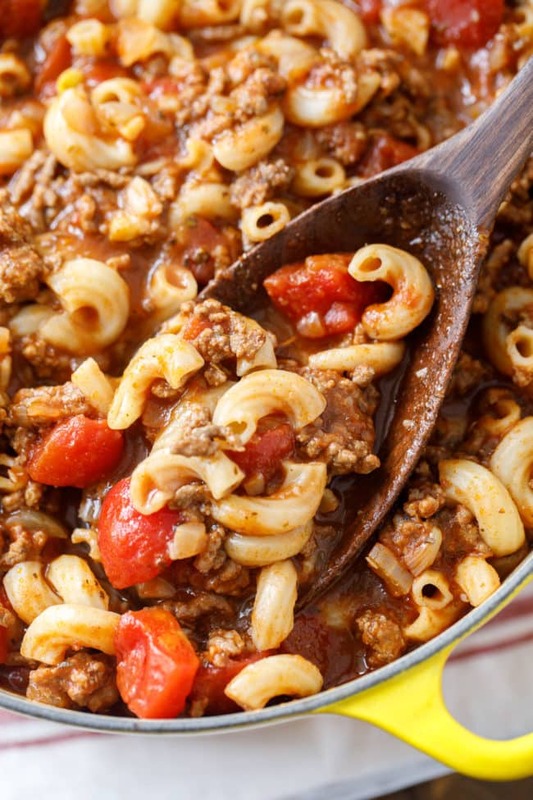 It’s all about coming up with just the right combination of red sauce, spices, pasta and ground beef to make the perfect goulash. Luckily, this dish is pretty forgiving and leaves you plenty of room to tweak the recipe to your own personal preferences. 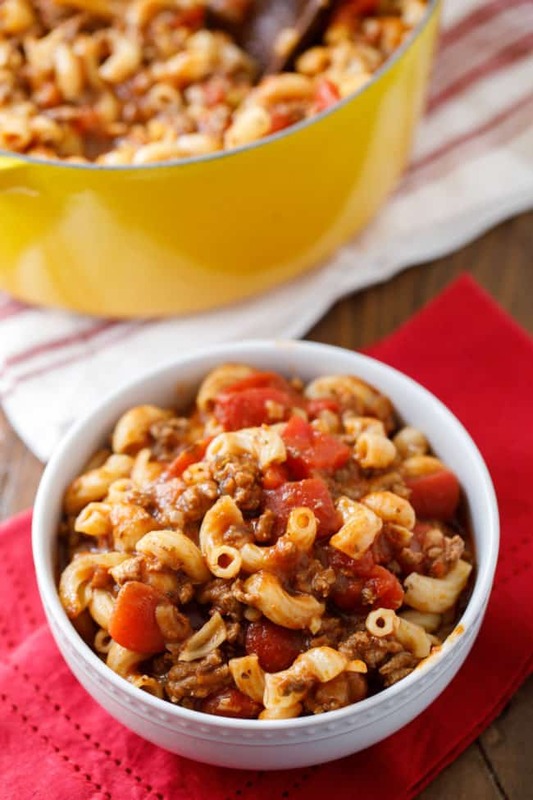 This easy goulash recipe is also a big hit with the kids. My son and daughter are just as excited about having this goulash for dinner as my brother and I were on days when my grandma made it. In other words, you simply can’t go wrong when you make this easy, old fashioned goulash for dinner. Trust me, your whole crew will love it! This is also the type of recipe that tastes great as leftovers throughout the week. As a busy mom, it’s super important to me that my dinner recipes get plenty of miles. Being able to warm this goulash up on days two and three is such a timesaver. Be sure to watch our tutorial video below, and let me know in the comments if you love this recipe! Also, you definitely want to be following me on Instagram because I have some amazing recipes to share there this week! 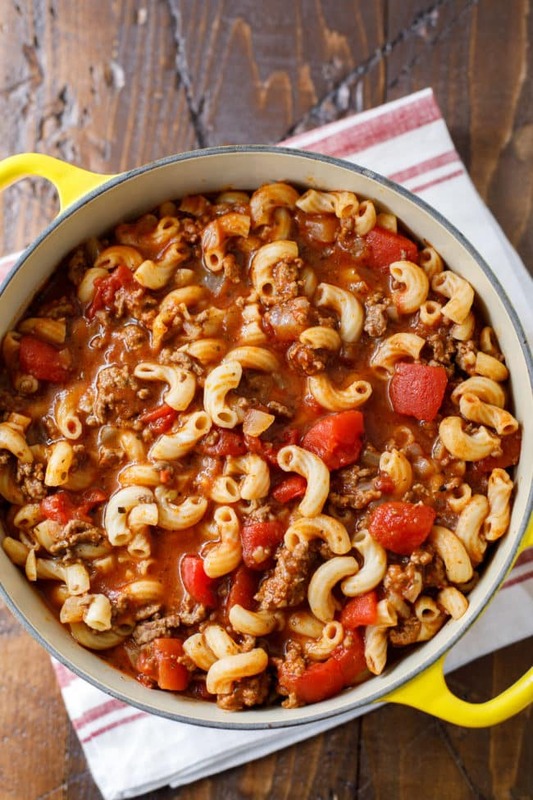 This old fashioned goulash (or Johnny Marzetti) is the perfect crowd-pleasing family dinner recipe! In a Dutch oven, saute the ground beef over medium-high heat, until no pink remains. Break up meat while sauteing; spoon off any grease. Add the onions to the pot and saute until they are tender about 5 minutes. Add 2 cups water and one cup beef broth, along with the tomato sauce, tomatoes, garlic, bay leaves, Worcestershire sauce and seasonings. Stir well. Place a lid on the pot and allow this to cook for 20 to 25 minutes. Add the elbow macaroni, stir well, return the lid to the pot and simmer until pasta is al dente, about 4-5 minutes. Pasta will cook a bit more when you remove from heat. IMPORTANT: be careful not to cook your pasta too long, mushy goulash is not good! Remove from heat, remove the bay leaves. Serve warm and top with shredded cheddar cheese. This is so good and so easy. My mother made it when I was a kid (60 years ago) and I saw the recipe and thought I’d try it. So glad I did! This recipe was very good. I cut down on the garlic some ( 3 gloves only, no garlic salt) and it turned out perfect for us. It seems like a lot of liquid, but it all cooks off turns out wonderful. This is a delicious old fashioned AMERICAN goulash recipe. It is such a classic comfort food. Please refrain from saying this is not Hungarian goulash/goulash/authentic goulash/etc. This is the best goulash recipe I have ever made! So easy & so good!!! I made this goulash last night and added 2 stalks of celery diced, a handful of diced green bell peppers and a large white onion diced. Sauteed them in water until tender. I put ground sirloin in COLD WATER and broke up with clean hands or use a potato masher and simmer until water is gone; then followed the recipe. THIS IS THE BEST GOULASH ON THE INTERNET, LOOK NO FURTHER! Katherine how much water did you use to cook the ground sirloin? This is very close to my Mom’s goulash, or I should say what we called goulash. She added kidney beans to hers and never added cheese. Her goulash was more of a soup. I remember Johnny Marzetti being one of our school lunch options. That was much thicker and very cheesy and WONDERFUL! Your recipe is AWSOME! It is a total mix of the two I have had and we LOVED every bite. I’m late to the game in finding this, but I am so glad I did. Thank you!! What a nice comment, Stephanie, thanks! So glad you enjoyed it! Made it tonite, top notch, we loved it and thanks for posting this recipe. This dish was outstanding. My husband said it tasted like his mom’s! There is no better compliment! Thx so much for such a delicious and easy recipe. Made this today. Love it. Thanks for sharing. Cracking up because nowhere did you mention this was Hungarian or German… I’m certain my eyes are reading American Goulash and American Chop Suey. Anyway, I’m looking forward to trying this! I only had goulash once as a child at one of my friend’s house in midwestern America. I remember enjoying it. I’m hoping I can get my picky 4 year old to try it! Totally delicious, thank you for sharing. 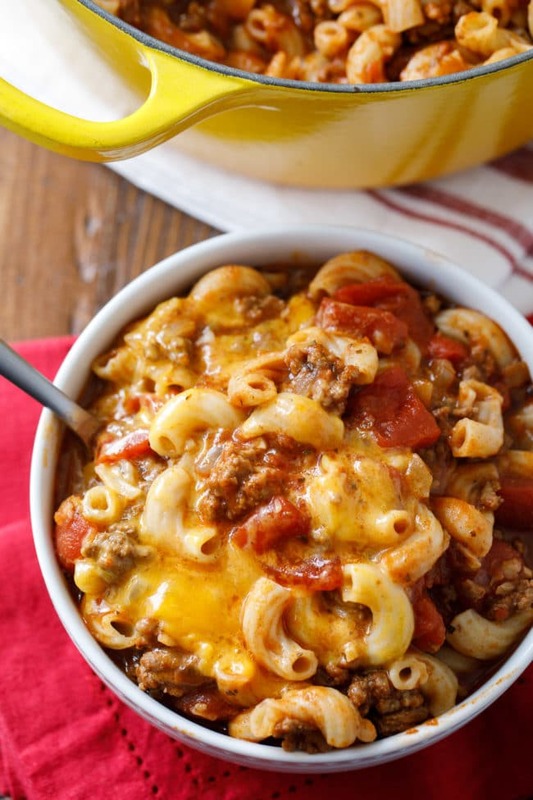 Goulash is always a favorite family favorite! And, leftovers are the BEST! I think it’s because the noodles soak up all the flavors, making it extra yummy. OMG this was delicious. This was my first time making goulash. My husband said his mom used to make it, so there was a lot of pressure to try to live up to mammas home made goulash. Thanks to this recipe I nailed it. My husband and sister in law both gave it a big thumbs up. Great recipe. Will make again for sure. Please…does the goulash require 1 cup or 1 30 oz. beef broth?? I just made this, and have made goulosh at least 400 times in my life. NO KIDDING. This recipe is delicious. The Worcestershire is the key. I used an extra TBS. If this is Hungarian or German or ? Who cares its really good. Thank you soooo much. My father was German, my mother is Hungarian, and that is who taught me. This is better. I too have been making my grandmothers old fashioned goulash for decades. The picture of yours looks exactly like my goulash but I don’t have as many ingredients. I just fry hamburger and onion, drain grease, add 5 beef bouillon cubes and a big can of crushed tomatoes and simmer while macaroni is boiling, then add the mixture to the macaroni when almost done as to not have the macaroni too soft. This is our go to recipe. I’ve made it several times and my family loves it. 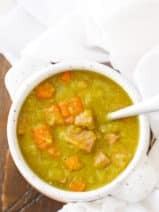 Dear Chrissy I have made your recipe and it’s great but we have enough left overs so L froze them what it’s the best way to reheat the frozen left overs thankyou for your help. AHALA…Classic German Goulasch Suppe IS like a soup, what you make is Hungarian Beef Paprika Stew “Paprikas Krumpli”, a variant of Goulash!!!! My moms Hungarian Goulash (with paprika and bacon) tasted different than my dads German Goulash(w/ onions, beef, seasons , stew tomatos and red cooking wine). If you research Goulash, you will find it has origins from Hungary …Gulyas, but Europe and Eastern Europe have their own variety I say let the people make their preference, and stop saying it is not Goulash….OK!! Grab a bigger pot (5-6 litres), and cut up one big, or two small onions. Melt 2-3 spoons of pork fat (However I prefer olive oil instead of fat), and simmer the onion a while. When it got “glassy”, turn up the heat, drop the diced beef meat into the pot, and toast the beef a bit, but carefully, do not let the onion to burn. Then turn down the heat a bit, and add the diced paprika and tomato. After a while it starts withering, turn the heat to the minimum, add the red paprika powder (I use a lot – 3-4 spoons – I like when the soup is finally so red), mix it up very quickly, and add 1.5 litres of water. Turn up to medium the heat, and let the soup boil slowly. From this point the key is being patient and cook slowly. Add salt as you like, and spice it: tarragon, basil, ginger (carefully, just a little!) and thyme. Remember: these spices are optional. If you use venison, you may add juniper berries. In the meantime peel, and cut up the vegetables into rounds, and add to the soup. When all the vegetables is in the soup, fill up the pot with water, but let some space for the potato. Cook for a hour, then peel and dice the potato, and add to the soup. Cook until the potato is cooked, or the meat get soft – the best is when the meat melts in your mouth. You made a few mistakes in the recipe…pepper is = black pepper (bors) ! Hungarian red paprika powder is what you need and not pepper! You need just a little black pepper (bors) but mostly you need paprika. The other is not turnip! Turnip= retek es tarsai! You need parsly root or parsnip, potato and carrot. Those additional “optional” spices are not authentic at all…totally different tast and flavor. What makes a guylyas real gulyas is caraway seed! Juniper berries and ginger? OMG! Where did you get that idea! Hell NO! Thanks for the advise on my mistakes, especially the red paprika powder, I was not aware that is referenced by this name. My bad. I strongly against putting caraway seed, despite most of the recipes counts that as an authentic spice. I also never use black pepper. Ginger, tarragon and basil makes the taste of the soup fruity, and highlights the flavor of the vegetables. Juniper berries also improves the acidity, resulting an exciting, airy soup. After all, goulash is a soup. I traveled to Budapest many years ago and remember the goulash soup I had at the flea market. 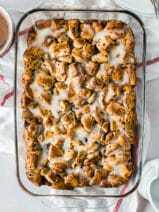 I am excited to try your recipe and hope it brings back many memories of my vacation! My mother used to make this when I was a kid and I absolutely love it! Can you please tell me approximately how many servings this recipe will make? I’m wondering if 2 lbs of ground beef is too much for my family of six. I made this last night for a church diner for 80 people. I took the original recipe and multiplied it up. I wanted something that I could finish in the oven to serve in bulk. I decreased the water by about half so it would set up. I cooked the macaroni for only about 4-5 minutes. So the macaroni was pretty soft in the final version, but everybody seemed to like it with some even coming back for seconds. So I classify this as a win!! The flavor was spot on. Do not have a Dutch Oven…does that make a difference? My father made this for us growing up. I made it tonight and added mushrooms and green pepper! One of my favorites! 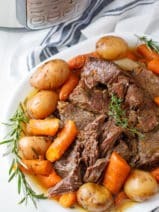 I will be trying this as suggested on how to prepare but I was wondering would you have how to cook this in a slow cooker or instapot. Add green lima beans and corn to this! Gives it much more flavor! I also like soup crackers with it! Yummy! Great recipe. I’d suggest 4-5 minutes for the pasta since it’s going to continue cooking after removing from heat. I don’t care what you call it, my family and I call it amazing! Cut the recipe in half and added a can of corn. I also used gluten free elbow noodles. So good!! We’ve always called red hotdish or (catholic) funeral hotdish, in our family. My grandma, and now so on down the lines in the families make the sauce & noodles seperate and then mix it together. We also add corn. 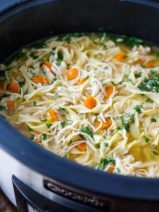 I have tried your receipe as well and it is also very yummy, but you are correct, you do need to be careful not to overcook your noodles. I agree, this is better the next day, this is true comfort food! I LUV leftovers. I think its because when it has time to sit the flavor intensifies through it. Longer it site = more flavor. I find that with a lot of dishes I have leftovers with. It seems to taste even better the 2nd or 3rd day. With weekdays SO hectic, not getting home till late & having to make a big meal on top of that. I just can’t do it any more. So I spend my weekend(either Sat or Sun) cooking a big meal & make sure to make extra so I have leftovers for a few nights during the week. That way I know my family is getting nutritious meals throughout the week, instead of getting fast food or having something like hot dogs. I’m not as fond of cooking big meals in the summer when its hot & we can make something quick on the grill. But as soon as fall comes then I start cooking on the weekends. Some times I’ll still make bigger meals on the weekends in the summer but not all the time like in the fall, winter & spring. This looks so good! It would really warm my family on a cold, snowy day! This looks perfect for a cold winter day! I haven’t had this for years and I will be using this recipe!